This is an amazing watch whose technology requires a bit of explanation. 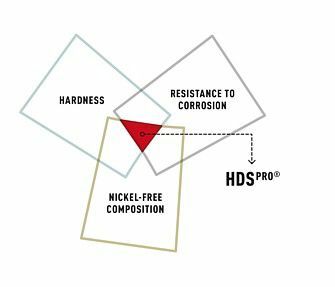 These watches are the first to feature cases made from HDSPro® stainless steel, which is 100 more times more scratch resistant than standard stainless steel. While visiting Hanhart in Germany, we were invited to take a sharp object and try to scratch the case - we tried and failed to leave a mark. 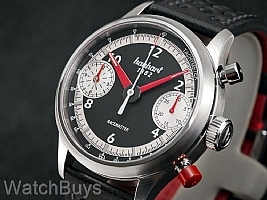 Hanhart was closely associated with motor racing in the 1960's and 1970's and the Hanhart Racemaster Series pays tribute to this heritage. The Hanhart Racemaster GT features a striking dial with high legibility. This watch incorporates a number of unusual movement and design modifications. 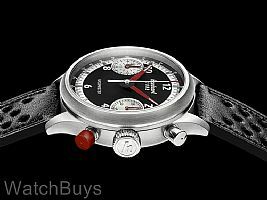 This watch is water resistant to 100 meters and is fitted with a calfskin strap in racing colors and design.